Campaign gifts funded faculty and student research, enhancing the global impact of the university. Athletics programs and the Razorback Bands were supported through the campaign. 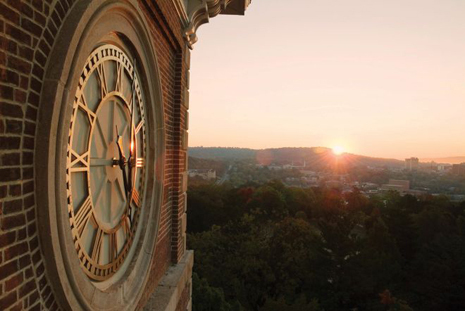 Thanks to the campaign, a clock was added to Old Main, where many thought a clock had always been. Many scholarships were funded during the campaign, giving more opportunities to students. When the campaign ended June 30, 2005, the campus community celebrated a successful initiative. FAYETTEVILLE, Ark. – When the University of Arkansas publicly announced the Campaign for the Twenty-First Century a decade ago on Oct. 26, 2001, the campus community was invited to a pep-rally style event on the steps of Mullins Library. At that time, $270.3 million had been raised in gifts and pledges. A few months later, the largest gift on record to a U.S. public education institution was announced — $300 million from the Walton Family Charitable Support Foundation. Fast forward to June 22, 2005, when the university announced that the campaign had surpassed its $1 billion goal. Eight days later, the campaign came to a close, and the total amount raised was $1.046 billion in gifts and pledges. Outcomes of the Campaign for the Twenty-First Century include the creation of the Honors College and endowments for the library and Graduate School, 132 endowed faculty chairs and professorships and 1,738 scholarships and fellowships. More than 41,600 new donors participated in the campaign, and the total number of individuals who contributed reached 72,641. In sum, benefactors made 304,328 gifts and pledges to the campaign. Since the end of the Campaign for the Twenty-First Century in June 2005, more than $500 million has been raised in private gift support for the university. The University of Arkansas will celebrate this 10-year mark throughout the coming months by recognizing the impact that the $1 billion effort has had on its colleges, schools and departments. Two units — the Honors College, which was created during the campaign, and the Graduate School, which became endowed — will hold celebrations with alumni and current students in 2012. Campaign funds were raised for six critical areas of need: faculty positions, scholarship funds, improving existing academic programs, creating new ones in key areas, strengthening University Libraries, constructing new academic facilities and increasing annual giving to enhance a variety of university programs. Volunteer leadership included a nearly 100-member steering committee made up of alumni and friends throughout the state and nation led by the campaign co-chairs: Rob Walton (B.S.B.A. 1966), Tommy Boyer (B.S.B.A. 1964), Jim Walton (B.S.B.A. 1971) and Frank Broyles. Johnelle Hunt served as treasurer for the duration of the campaign. The executive committee also included George Billingsley (B.S.E. 1957), Sylvia Boyer (B.S.E. 1963), James Faulkner (B.S.J. 1954), Mary Ann Greenwood (B.S.B.A. 1962, M.A. 1972, Ph.D. 1979), Kaneaster Hodges (L.L.B. 1967), Thomas McLarty (B.S.B.A. 1969), David Pryor (B.A. 1957, L.L.B. 1964), Charles Scharlau (L.L.B. 1951), Julian Stewart (B.S.C.E. 1957), John Tyson and Fred Vorsanger. Find us on Facebook at http://www.facebook.com/UofArkansas and tell us how the Campaign for the Twenty-First Century impacted your life.